In a post we published in August of last year, I concluded that Facebook Live wasn’t a live streaming contender…yet. Back then Facebook was only making the app available to a limited few. Facebook was also very hush-hush on its plans for video on its platform. Now, they have made it increasingly clear that video is core to their platform’s future. Also, slowly but surely, they have added features, increased functionality and, most importantly, made the app available to larger groups of people. Also, on April 6th Facebook rolled out the ability to go live in groups and events! Forget what I said last year. Facebook is definitely IN, if not LEADING, the live streaming race. 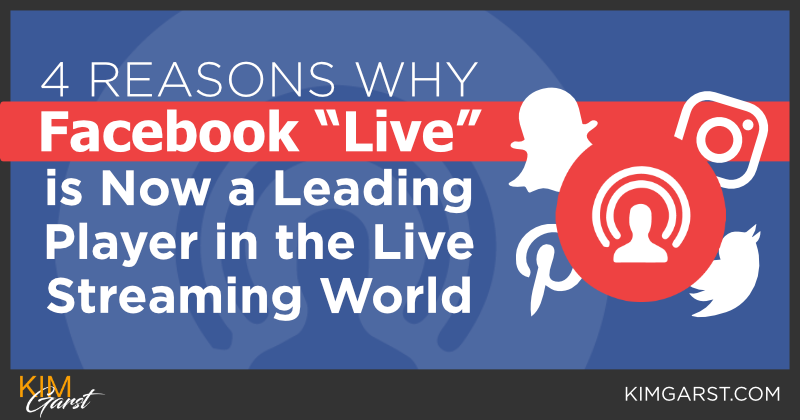 Here are 4 reasons why Facebook “Live” is now a leading player in the live streaming world. Facebook Live is now available to everyone! When Facebook Live was first made available last year, it was originally only for verified pages. This meant it was limited to celebrities, global brands and major media outlets. It was also only available for some pages, so individual users couldn’t broadcast a live stream on their personal profile. Not anymore! Facebook Live is now available for anyone with a Facebook profile and, soon, every Facebook Fan page will have it too. Facebook Live is incredibly easy to use! The world has gone mobile and Facebook has made getting on, and using Live on your smart phone incredibly easy. Here is how you do it. When you are ready to finish your video stream, tap Finish. One of the advantages of Facebook Live over Periscope is that your video will automatically be saved in your timeline, so even if your group can’t watch it live, you don’t have to worry about your video being deleted immediately after 24 hours like with Periscope. This means you can save your video for a newsletter, a blog post or even upload it to YouTube without having to use a third-party service! Notifications will be sent to everyone that’s liked your page! Mark Zuckerberg made it clear in recent comments that a huge emphasis is being placed on Facebook Live and connecting people across the platform using video. To support that goal “Live” notifications are being sent to everyone that liked the page from where the broadcast originated. Previously, someone would only receive a notification about a live stream if they had recently interacted with a page. One of my previous concerns was that the percentage of fans that would actually see your live stream in their feed could be as low as 5% of your total fan base. With the new rollout, live stream notifications are currently being sent out to ALL fans of a page regardless as to when they last interacted with it. Plus, Facebook will prioritize live feeds over saved videos in its ranking algorithm. You can make your events “exclusive”! Eight months ago, Facebook Live’s broadcasting audience could only be set with the general privacy settings (Public, Friends, or Custom), but with this latest update, you can now set events for specific groups! Do you want to show off your newest product or do a special Q&A for an “exclusive” audience? That’s now an option with Facebook Live group selection. Facebook has also reported that live videos get 10 times more comments than regular videos. So you can generate greater excitement for your events AND get more feedback. Hopefully you’ve already been planning for this news and you’ve developed your strategy to use Facebook Live to stay ahead of the competition. Are you using Facebook Live? What do you think? I would love to hear from you in the comments below. Karen, Facebook has a map functionality just like Periscope and they recently rolled out an aggregator for the mobile app that surfaces LIVE video content as well. Hi Kim, I’m really looking forward to using Facebook live this year. I especially love being able to do live video is groups now. Game changer. you must update it “Facebook Live is now available to everyone!”. Anyone can be live on Facebook without any single like. And Facebook Live contains some really good features and benefits which help my business to grow without spending any money on Paid Advertisement. Yes at some point you are right but at some point, it does not make any sense.